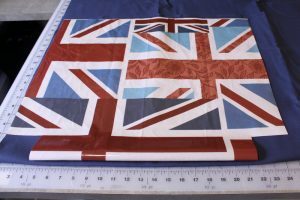 I fell in love with this Union Jack PVC fabric! 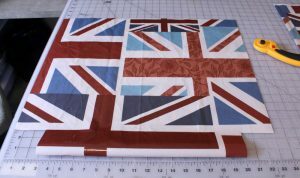 The PVC fabrics from Terry’s Fabrics have such a nice, heavy hand. 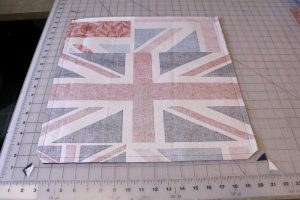 I knew this fabric was going to become a bag. 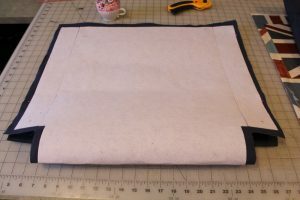 I was inspired to make a huge, messenger-style bag that I am dubbing the “Subway Bag” because of my jazz-piano-playing son. He recently traveled to big cities and small towns to check out graduate schools, take lessons, and have auditions. He is always hauling big binders of sheet music. 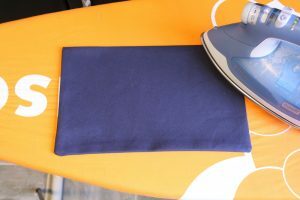 I thought a laminate bag would be perfect for his – or anyone’s travels….especially if you have to set the bag down on the subway. You can simply wipe it clean! 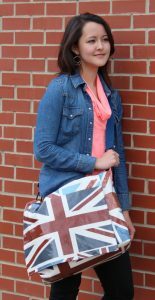 The finished size of the bag is 16″ wide x 6″ deep x 13″ high. It’s really big! 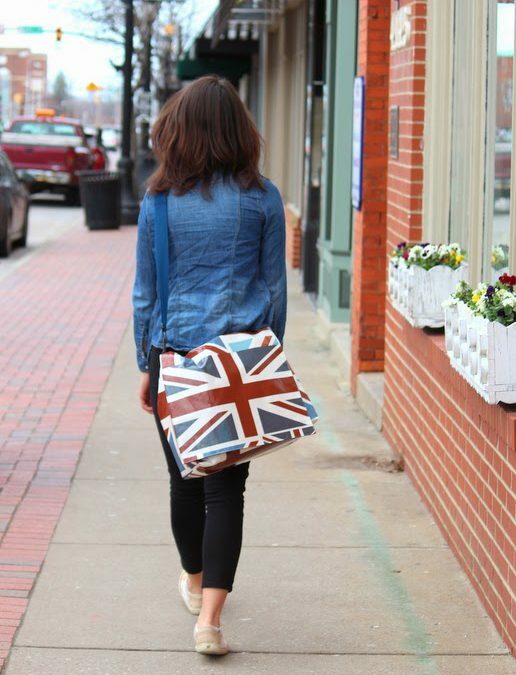 You can certainly downsize it or search for other size messenger bags on the internet. 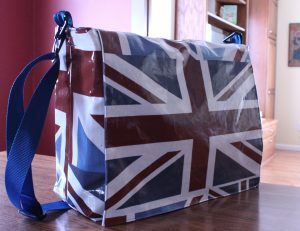 I have been using the bag to take my packages to the post office. 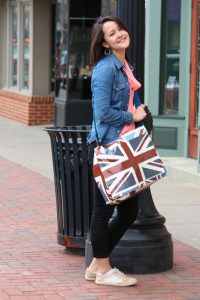 It’s also a great size for a diaper bag! 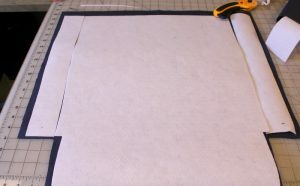 Cut laminate fabric, on the fold, so that it is 23″ wide x 20″ high. 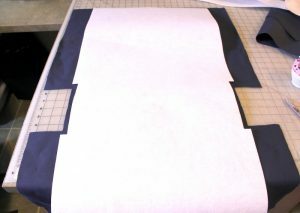 Cut a 3″ x 2″ square out of each bottom side. 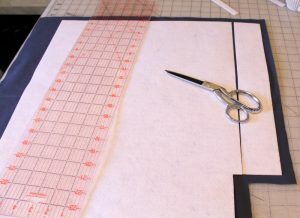 Using the laminate piece as a pattern, cut the folded duck cloth lining to the same size. Make pocket. 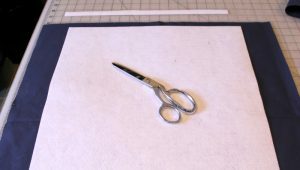 Start by cutting duck cloth on the fold so that it is 13″ wide x 8″ high. 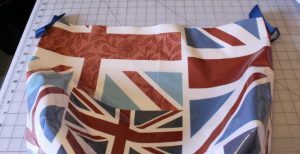 With the fabric folded at the top, stitch around the other three sides, leaving a 4″ opening for turning. 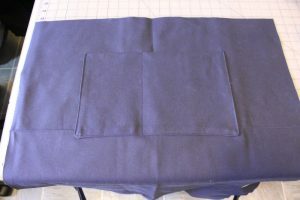 With the opening at the bottom, center the pocket on the lining, 4″ below the top. Pin. 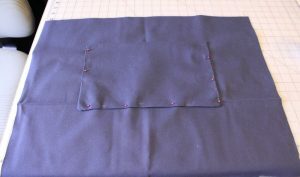 Stitch the pocket in place. 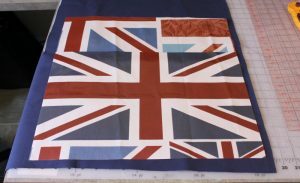 Stitch a dividing line if desired to have several different sizes of pockets. 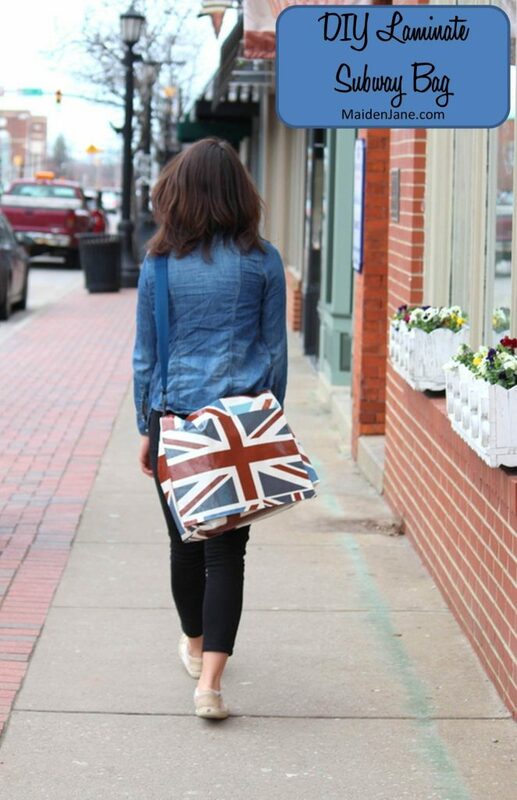 I wanted this bag to have some body. 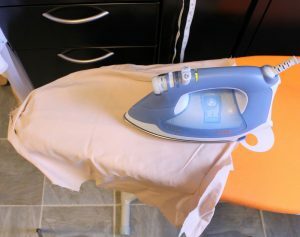 So I selected a heavyweight interfacing. 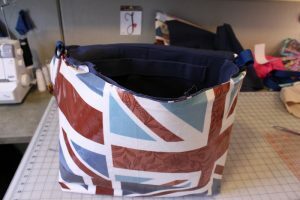 To enable the bag to have a boxy shape, I used a separate piece of interfacing on the side. 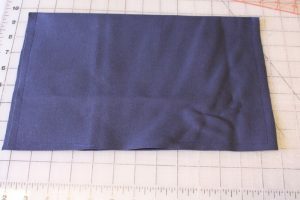 Trim 1/2″ of the interfacing off wherever there will be a seam to make sewing easier. Fuse interfacing according to instructions. 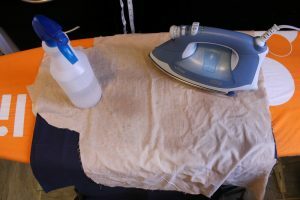 I used a press cloth and a spray bottle of water. 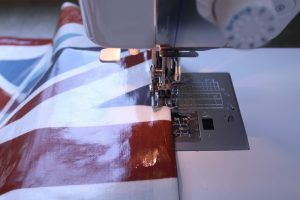 Sew lining. 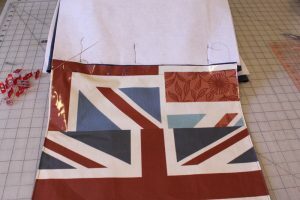 With right sides together, sew the side seams using a 1/2″ seam allowance. 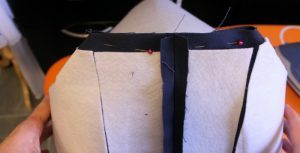 Create a boxed bottom by bringing the side seam to the center of the bottom. Pin and stitch. Repeat with the other side. 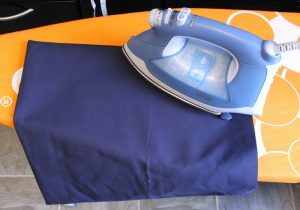 Sew the laminate outer bag in the same way as the lining. Finger press the seam allowance open. 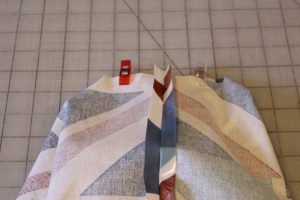 Cover the seam allowance with a press cloth and press. 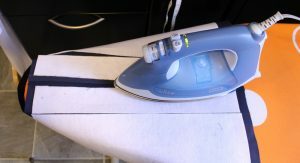 Avoid pressing an iron directly on laminated fabrics. 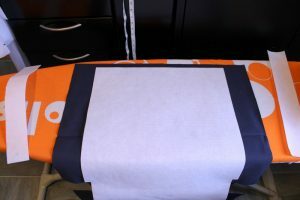 Create the boxed bottom and sew. These Wonder Clips are perfect for working with laminates, but pins work also. 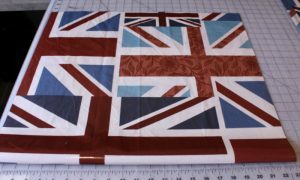 Cut one layer of the laminate 18″ wide x 18″ high. 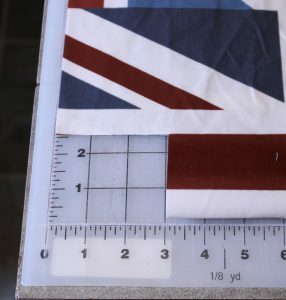 Cut the lining fabric to the same size. Sew around three sides. Trim corners. Turn inside out. 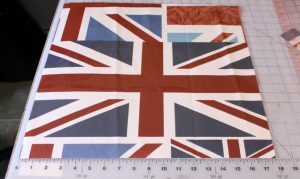 Press from the lining side. Top stitch the flap. 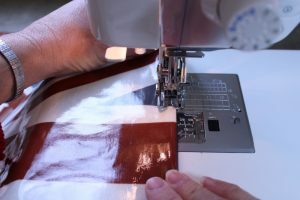 To sew on a laminate fabric, use a sharp needle, set your stitch to a long length and use a walking foot or roller foot. 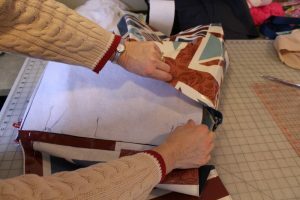 I often use two hands to gently guide the fabric. 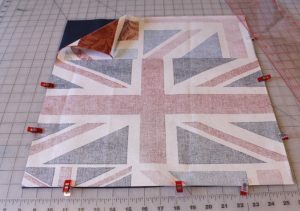 The bag flap is top stitched. 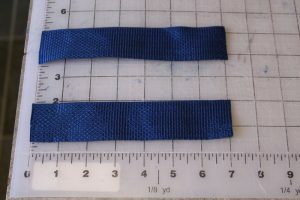 Cut two pieces of webbing 7″ long. 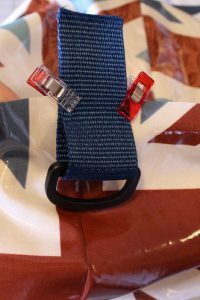 Insert a D ring and clip the webbing to the top sides of the bag. 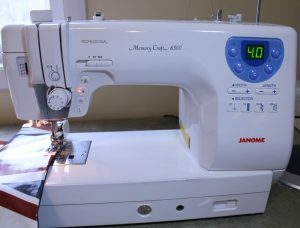 Stitch the strap to the bag at 1/2″ from the top. Baste the flap to the bag lining. This is the trickiest phase of the bag construction. 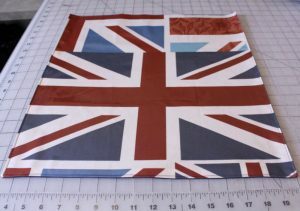 First, fold down the 1/2 seam allowance along the top of the bag lining and press. 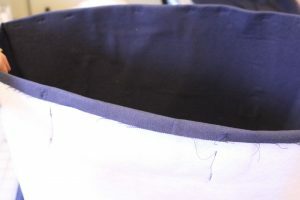 Place the flap, with the lining side facing up, below the top edge of the bag and pin. Stitch. 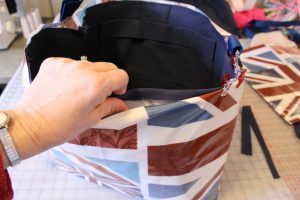 Place the lining inside the bag, wrong sides together. 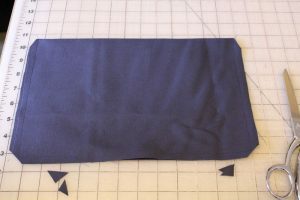 Fold the outer fabric 1/2″ to match the lining fold and clip the fabrics together. 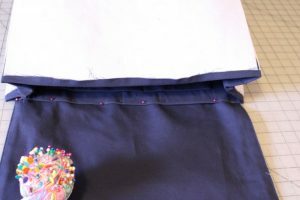 Sew the lining and bag together by sewing around the top. This is a little fiddly, especially on my machine because I do not have a free arm. 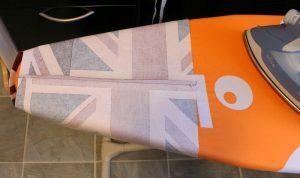 I actually used some tape to keep the two pieces together along the flap. The bag portion is complete! 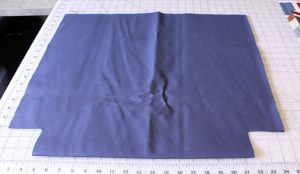 Cut a 60″ length of webbing. Place the slider onto one end. 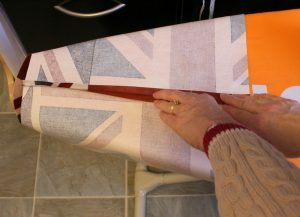 Fold the end twice to encase the raw edge. Stitch. 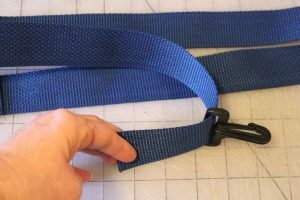 Take the folded edge and fold it onto the strap and stitch in place. 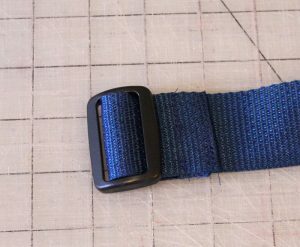 So you have taken the edge of the webbing, placed it through the slider and stitched it down to the webbing. 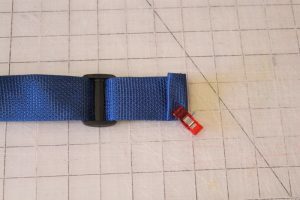 Take the other end of the webbing and put it through one of the swivel clips. Take that same edge and place it up and down through the slider as shown. 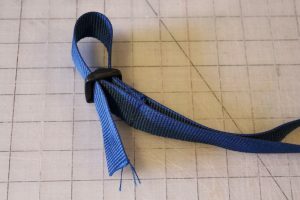 Take the end of the webbing, slide it through the other swivel clip and stitch it down, encasing the raw edge. awesome! I love it when I can make something cute and totally practical. 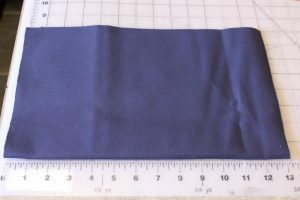 This fabric is perfect! 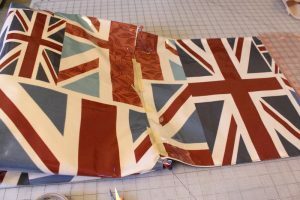 What a great project and your tutorial was so easy to read. I made three of these for special nieces and a nephew this past December and I could not find a tutorial so I had to figure it out on my own. 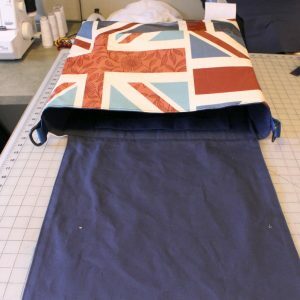 I made themed bags – Batman, Captain American and Dr. Who (a tardis). It sure make my creative brain work overtime!